Exclusive reader offers from Sevenoaks Sound & Vision | What Hi-Fi? There are additional savings on the Panasonic range of flatscreen TVs and a free five-year warranty if purchased before 31st December 2009. All exclusive What Hi-Fi? Sound and Vision reader offers must be claimed in-store, none are available by mail order. These offers are available up to and including Sunday, 3rd January 2010 (except the Panasonic TV offers) and while stocks last. To take advantage of these deals please quote 'WHF.com' at purchase. See www.ssav.com for Sunday opening. Please note: offer availability may vary from store to store, but all offers are available through Sevenoaks' central stock. 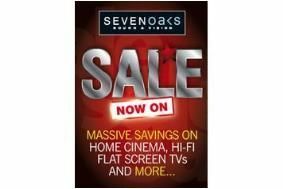 Click here for even more exclusive reader offers from Sevenoaks.